The stairway from the first floor of Jordan leading to the CSD clinic lobby has been closed off temporarily. Photo by Sorell Grow. Indianapolis’ population isn’t the only thing that was shocked by the 60-degree fluctuation in temperature over the past week. The extreme temperature jump caused a Jordan Hall waterline burst early the morning of Feb. 4, flooding and damaging the academic building’s basement. 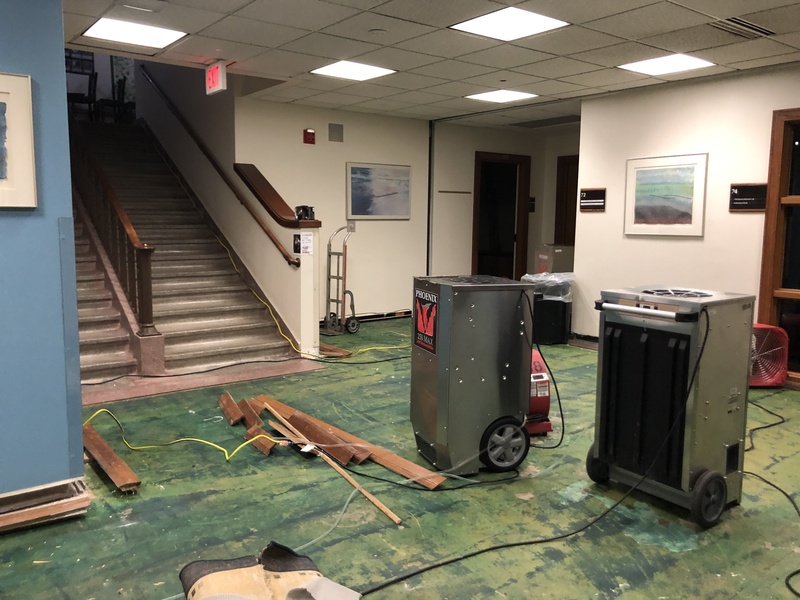 The water damaged the Communication Sciences and Disorders clinic area and forced at least 10 classes to meet in alternate locations across campus Feb. 4 and 5. The stairway from the first floor of Jordan leading to the CSD clinic lobby has been closed off temporarily and people have been asked to use the elevator to access the basement on that side of Jordan. The Jordan basement is home to several essential classrooms and offices, particularly for the CSD department. The recently flooded side of the basement houses four speech and language clinic rooms, a resource room with materials for articulation and language therapy, a language lab and an audiology clinic. Senior CSD major Jenny Schmick was preparing for her first day of working with outside clients in the speech and language clinic when she found out about the flooding. Speech and language client sessions will continue on as normal because those rooms were not damaged, but audiology clinic sessions are postponed for the time being, Schimick said. Clients from outside Butler come to the CSD clinics several times a week to have sessions with CSD students in the clinics and labs. Perhaps the most concerning impact of the flooding in the basement has to do with possible damage to the valuable and costly equipment such as audiometers and an audiometric booth. On Jan. 30, temperatures in Indianapolis hit a low of -10 degrees below zero but they heated up to the high 50s on Feb. 4. “The water flooding in Jordan was the result of a frozen chilled water coil in one of the air handlers,” Doug Morris, associate vice president for facilities, said in an email. With the extreme cold, the pipe within that coil froze and then started leaking as the warm weather allowed it to thaw, Morris said. Donald Borden, project manager and maintenance system coordinator, is coordinating basement repairs. Rain will not affect the flooding because the water was already in the system, Borden said. An outside contractor was hired to help with the clean up and repair process in the wet basement, Borden said. On Monday, the contractor vacuumed up the excess water and put in dehumidifiers and fans to dry everything. The carpet in the basement lobby area has been pulled up and is being professionally cleaned and dried. The wall surfaces have been opened up to take daily moisture readings because the biggest concern right now is the moisture levels, which could lead to mold. Before the contractor can start restoring the carpet and other flood damage, the moisture needs to evaporate, so they will put in antimicrobial solution to prevent mold and other bacteria from growing, Borden said. Borden asked the university registrar to move classes from the basement area until Monday, but it still may not be ready then. It is unclear when the basement damage will be repaired, as the maintenance crew is at the “mercy of dry-out process,” Borden said. His team has to adhere to the drying process and see where moisture readings are at.